Gorleston-on-Sea (/ˈɡɔːlstən/), known colloquially as Gorleston, is a settlement in Norfolk, England, on the south of Great Yarmouth. Situated at the mouth of the River Yare it was a port town at the time of the Domesday Book. The port then became a centre of fishing for herring along with salt pans used for the production of salt to preserve the fish. In Edwardian times the fishing industry rapidly declined and the town's role changed to that of a seaside resort. Historically the town was in the county of Suffolk. In the Middle Ages it had two manors, and a small manor called Bacons. In 1832, it became a part of Great Yarmouth for electoral purposes. Finally in 1835 it merged with the town and became part of Great Yarmouth in the county of Norfolk. Gorleston Barracks were established in 1853. There used to be two railway stations. Both were on the coastal line which joined Great Yarmouth with Lowestoft - Gorleston-on-Sea closed in 1970 whilst its neighbour, Gorleston North closed in 1942. It is a seaside resort and tourist destination. Its main attraction is its sandy "Edwardian Beach." It has traditional seaside gardens and model boat pond. It also has a theatre opposite the pier called the Pavilion. The main shopping centre is on High Street. It has its own golf club. There is also the hospital and a library. 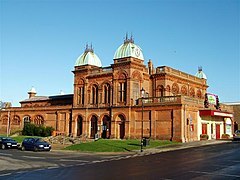 The nearest railway station remaining open is the Great Yarmouth railway station. There is a lighthouse, lifeboat station and coastwatch station on Riverside Road. In the Great Storm of 1987, Gorleston-on-Sea experienced the highest wind speed recorded in the UK on that day, which was 122 mph (196 km/h). The town is meticulously described in the novel 'Gorleston' by Henry Sutton (Sceptre, 1995) and in Philip Leslie's novels 'The History of Us' (Legend Press, 2009) and 'What Remains' (December House, 2013). Both Sutton and Leslie employ the actual names of roads and retail outlets in their work. Peter Simpson (born 1945) former football player,  370 pro appearances for Arsenal F.C. Paul Derek Gibbs (born 1972) former professional footballer,  approx. 200 pro. appearances. ^ "Great Yarmouth Ward population 2011". Retrieved 24 August 2015. ^ "Southtown Road Workshop Range". English Heritage. Retrieved 17 October 2016. ^ RNLI history of Great Yarmouth & Gorleston lifeboat station Archived 8 January 2009 at the Wayback Machine. ^ "East Anglian School for the Deaf and Blind". Norfolk Deaf History. Archived from the original (GIF image) on 19 April 2015. Retrieved 9 April 2015. ^ Gosse, Peter. "EAS moved to Wales During the War 1940-1945" (PDF). Norfolk Deaf History. Archived from the original (PDF) on 19 April 2015. Retrieved 9 April 2015. ^ Clapham, Lucy (10 December 2012). "Blue plaque marks the spot of important Gorleston landmark". East Anglian Daily Press. Retrieved 15 November 2014. ^ Coates, By Liz. "Clinically dead X-Men actor revived at end of marathon". greatyarmouthmercury.co.uk. Retrieved 14 August 2017. Wikimedia Commons has media related to Gorleston-on-Sea. This page was last edited on 3 March 2019, at 02:03 (UTC).